Josef and Anni Albers were two of the pioneering visionaries of the Bauhaus, creating innovative designs that have stood the test of time. Fab has collaborated with the Albers Foundation to create this collection of homewares using Anni Alber’s Intaglio design of the 1970’s. Amazing how current and on trend that design still is today. 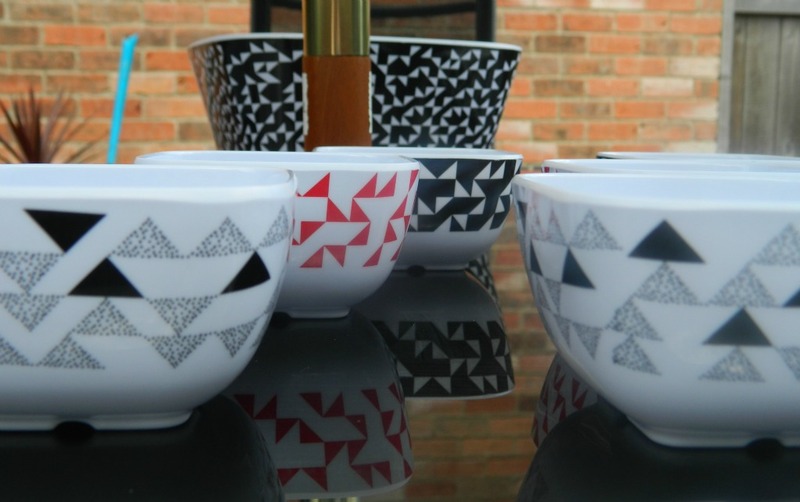 When I saw it, it actually reminded me of the geometric pattern and design of the Love Chic Living logo and so I was thrilled to be asked if I’d like to review some of the range. 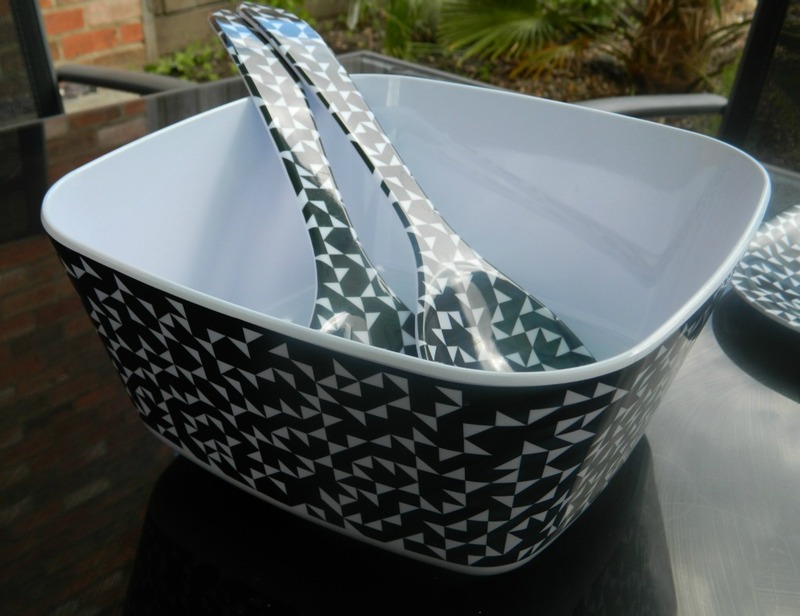 Firstly I’m looking at the Albers outdoor eating set from Fab.com available in 3 different colourways. The set of 6 mini bowls that you see in the above picture showcase those colour options and are delightful. Quite small and ideal for snacks and nibbles at the picnic table, my girls absolutely adore them and have comandeered them for their sweets! 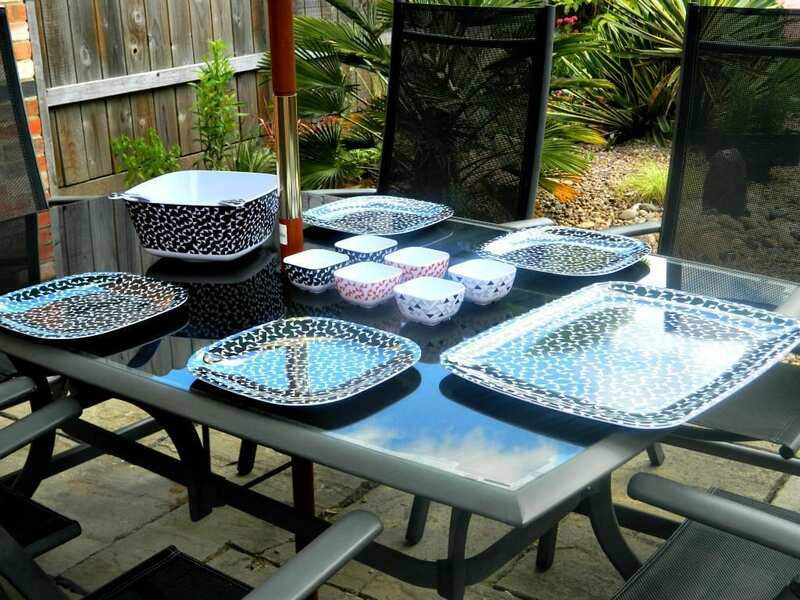 As you would expect of outdoor picnicware they are made of durable melamine and I’ve been really impressed at the quality. We have quite a bit of old melamine dinnerware that the children have used whilst young, and it’s nowhere near the thickness and quality of these products. They’ve been through the dishwasher many times already and look fabulous; I know they’re going to stand the test of time. 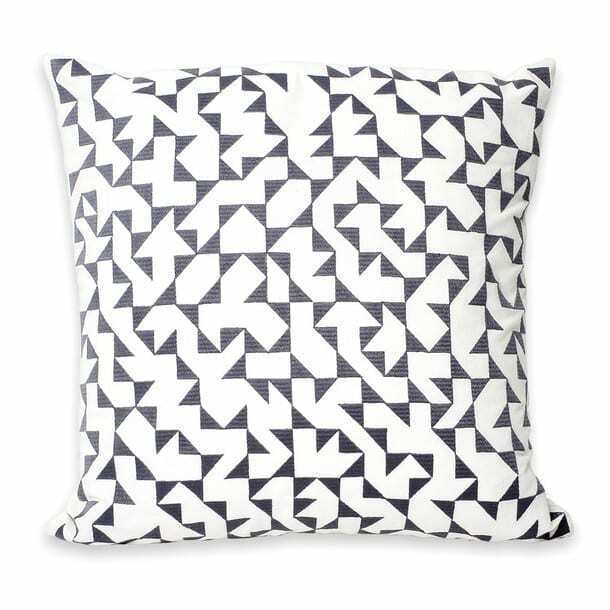 So what else have I been looking at from the Albers collection at fab.com. The set of 4 dining plates are much bigger than I thought they’d be and like the rest of the range are incredibly durable and sturdy. The tray again is a really good size and the salad bowl and servers are a great shape and design. In fact that’s what has struck me most about the whole collection; the design is so bang on trend and very cool. Lots of plastic melamine picnic ware doesn’t really focus on design or style and why sacrifice that just because you’re eating outdoors? Packed away in a picnic rucksack this set is ideal for taking to the park or the beach on your days out. Or if you’ve off camping or caravannig, pack this away in the car ready for all those times when you’re eating around the campfire. We’ve had great use of the set already, with family barbecues in the newly planted garden sitting around the table in the sunshine. The girls love to help lay the table and with this set I’m much more relaxed about them carrying the plates to the outside table across the hard stone patio! 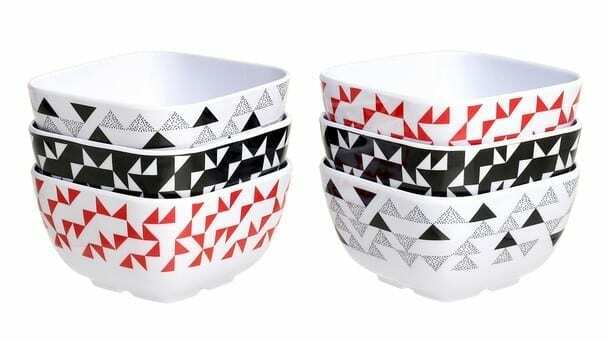 The Albers collection at fab.com is more than just picnicware though, and they’ve taken this lovely geometric design and applied it to other homewares too. 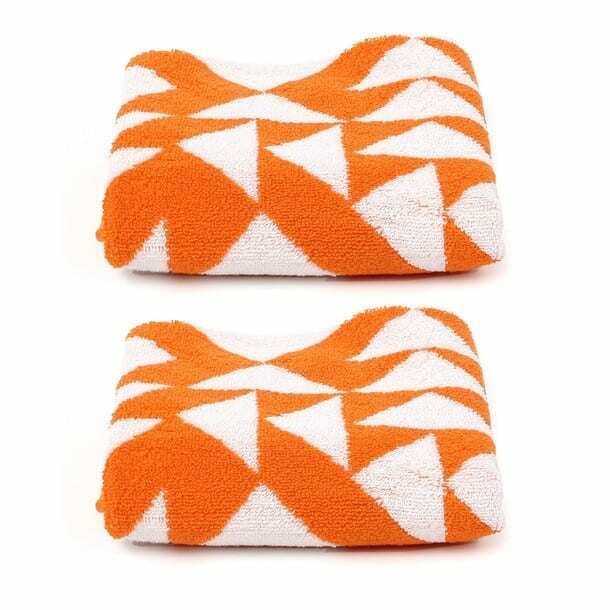 There’s the range of towels, bath mats and shower curtains for example, in grey, black, orange and ranging in price from £12-£32. And then there’s the selection of lovely pillows starting at £40. With a down filling these are gorgeous and superbly comfortable. I have a lovely pair in red and black. You can see all of these products and more at the Albers x Fab on fab.com. Thank you to fab.com for sending me a selection of the Albers collection to review. The comments and opinions are honest and genuine. I LOVE those patterns, so cool. How neat to bring out for a picnic of in the garden! Thanks Annie, yes the patterns are fab aren’t they! Now THAT is some seriously stylish picnic ware! That design is gorgeous – I love it! They look really cool. I love funky pieces that are just that bit different. It has been perfect eating out weather too. Bought some melamine bowls this week but they have flowers…now i am jealous as yours look so much better! this looks cool, I love geometric designs! Oh how cool are they?! LOVE! Thanks Steph, I have a couple of cushions in the range too, and they’re ace. Oooh I love these. the pattern is gorgeous. I like Angie’s suggestion of using it inside for the kids!